Rev. Daniel Harrington, SJ, an eminent scholar, author and professor of Sacred Scripture at Boston College’s School of Theology and Ministry, died at Campion Center in Weston on February 7, after a four-year battle with cancer. He was 73. Fr. Harrington’s dedication to Biblical scholarship was reflected in the more than 60 books he authored, shedding light on Scripture and the life and times of Jesus, and his decades-long tenure as the general editor of New Testament Abstracts, summarizing literature on the New Testament from hundreds of books and journals throughout the world. He also wrote “The Word” column for America magazine for three years. A longtime faculty member at the Weston Jesuit School of Theology in Cambridge, Fr. Harrington – who held two degrees from Boston College – returned to his alma mater in 2008 as part of Weston Jesuit’s re-affiliation with BC and joined the newly established School of Theology and Ministry (STM). In November, after Fr. Harrington had announced that 2013-14 was to be his final year of teaching, STM hosted a tribute that was attended by family members, friends, colleagues, and current and former students. Among the speakers was best-selling author and media commentator James Martin, SJ, who described the powerful impact of Fr. Harrington’s teaching. Fr. Harrington’s Introduction to the New Testament class “changed my life,” said Fr. Martin, who dedicated his forthcoming book Jesus: A Pilgrimage to Fr. Harrington. “Today, I feel like I see the gospels through Dan’s eyes. What I mean is that I see the gospels with both the eyes of faith and a critical mind. The son of an Irish immigrant, Fr. Harrington was born in Arlington and attended St. Agnes Grammar School where he was taught by the Sisters of St. Joseph. He won a full academic scholarship to Boston College High School where he also played hockey and baseball. Citing his positive experience with his Jesuit teachers, he chose to enter the Society of Jesus upon graduation and was in the first class of novices to enter the Jesuit Novitiate in Gloucester in 1958. In 1962 Fr. Harrington studied philosophy at Weston Jesuit School of Theology where he met Fr. John J. Collins, S.J., then editor of New Testament Abstracts (NTA), who enlisted his help in writing abstracts and book notices. He would be associated with New Testament Abstracts for more than 50 years, serving as its editor from 1972 until his death. After studying philosophy, Fr. Harrington studied Ancient Near Eastern languages at Harvard University, where he received his doctorate. While studying at Harvard, he took courses at Hebrew University and the Dominican École Biblique de Jerusalem. Fr. Harrington completed his theological studies at Weston Jesuit in 1969. 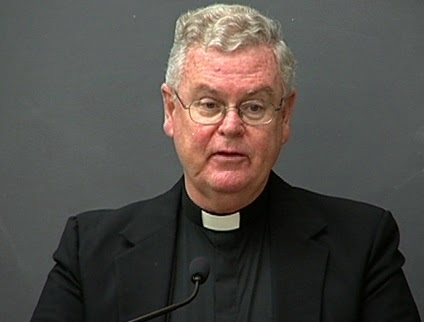 He was ordained in 1971 at St. Ignatius Church – in the very shadow of Boston College – and after serving as a professor of sacred scripture at St. Mary of the Lake Seminary in Illinois, became a faculty member at Weston Jesuit School of Theology in 1972. He is survived by his brother Edward, of Braintree, Mass. A wake is scheduled for St. Ignatius Church on Wednesday February 12, from 5:00 to 7:00 pm, followed by a Mass that evening. He will be buried at the province cemetery in Weston, Mass., on Thursday, February 13 after a mass at 10:00 am at the Holy Spirit Chapel in Campion Center.